The list of contributors to this book is amazing. Several are Nobel Prize winners. Others are famous intellectuals, including Steven Pinker, Jared Diamond, and Richard Dawkins. Many are professors in top universities around the world. Musicians, filmmakers, philosophers, psychologists, artists, scientists, writers…it is a truly astounding collection of brilliant persons who spent time on this question. And the approaches they took to the question are as varied as the disciplines they represent. Most of the essays are two-three pages long. A few are longer (I didn’t specifically count, but I don’t think any reached eight pages). Many are shorter. The very shortest is “Occam’s Razor,” by Katinka Matson: “Keep it simple.” (The strikethrough is in the original.) She succeeded. Some theories had several fans among the authors. Perspectives on evolution, natural selection, and other Darwinian themes were addressed by a number of authors. The double helix (DNA) takes its place, as do some odes to quantum theory, Einstein, and “the big bang.” Others are perhaps less well known, but the authors are enthusiastic in their advocacy. The “Law of Unintended Consequences” explores how almost any action in a complex system will have unintended results: some positive, some negative, but always unintended. “The Importance of Individuals” posits that every change in human history is the result of single individuals making decisions which influence others. Sometimes those individuals stir up a grass-roots movement and sometimes those individuals are in positions of great power but it is still one person making one decision and taking one action that leads to change. That person may be unknown to history, but the power to change the world is housed within every individual. Some of the essays I enjoyed the most addressed the question itself rather than trying to answer it. “Kepler et al. and the Nonexistent Problem” celebrates Kepler’s theory about the orbits of planets around the sun. The author delights in this theory that was deep, elegant, beautiful–and totally wrong. Some question the question, asking “what is deep, elegant, or beautiful”? Is it deep because it is correct? Is it elegant because it is simple…or is it elegant because it is complex? 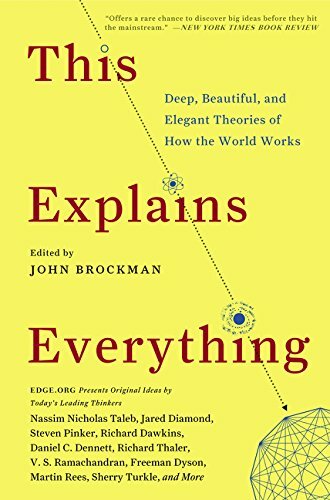 What makes a theory beautiful? Many of the essays which probe the question are, in my opinion, just as deep, elegant, and beautiful as the essays which actually try to answer the question. This Explains Everything can look intimidating, from its list of powerhouse contributors to its imposing 400+ page length to its intellectual subject matter. However, this book should not scare you away! First, most of the essays are short, many of them less than a page long. It is a great book to snack on. Read a few pages, put it down and let them digest, then pick it up again and read a few more. If one essay is not to your liking, move on! Second, the editor and writers have worked incredibly hard to make this accessible to people with curiosity and interest. I won’t pretend that it is meant for children. Adults with an interest in science, both physical sciences and social sciences, will find the book speaks to them. It may not actually explain everything. But it does open a window to the minds of those who are trying to find and grapple with the explanations for the world we live in.